Last night we dove straight into hell with Furnicular Productions’ Journey to the Underworld, and are unashamed to say we loved every minute of it. 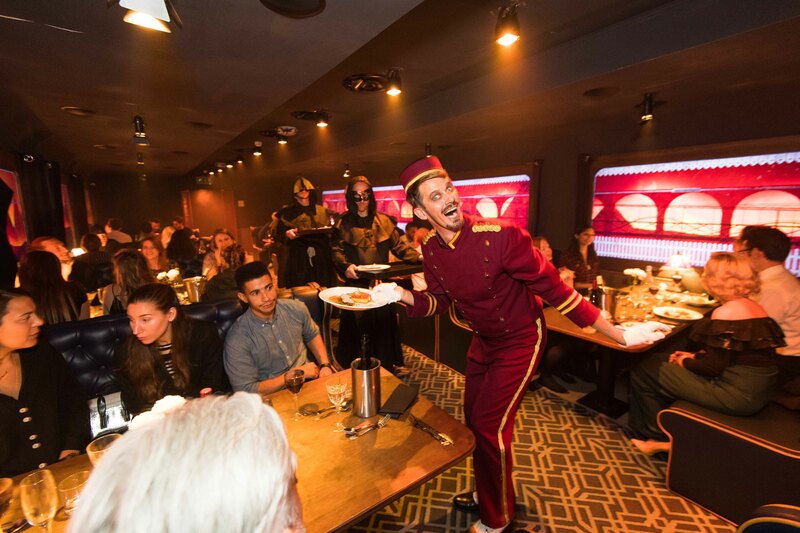 This dinner-meets-theatre extravaganza saw guests descend into a night of dark, devilish debauchery surrounded by a most thespian setting. Upon entering, we were welcomed into a rather filthy underground station – Pedley Street Station to be precise – and were met by dust-covered, withered objects that gave the appearance of some kind of abandoned home. Broken chairs, crooked clocks and cloth-covered objects of an unknown nature decorated the space. Mel even poked one of the cloth-covered objects out of curiosity and swear she felt a human knee… we soon found out she was right. The beginning of this show was actually our favourite part, mainly because it tricked us pretty damn well. Our main character, Claud, came bounding out from the filth-ridden cloth at the most unexpected moment, scaring nearby guests into heart attack mode… Mel knew she’d felt something human! The tricks continued as who we genuinely thought to be mere theatre guests started talking back rudely to the main character, only to find themselves ‘burn in hell’ quite literally. After a little dramatised speech-giving, Claud and his trustee companion Godi welcomed us aboard ‘The Murder Express’. That’s right, we actually got on a train. Not a real-life moving one, but a very convincing one nonetheless! Dinner served by our main man Godi! Aboard the rickety carriage, we were seated at tables that had been immaculately set up for our four course dining experience (black branded napkins and all). It was here where the interactivity began, and of that there was a lot. There were a couple games throughout the show which we found super fun and unifying. While sometimes gimmicks like these can come off as cheesy, JTTU pulled it off in true satanic style. We enjoyed the game with the ‘soul-inspector’, whereby one member of the audience had to slyly retrieve a key from the inspectors belt without her noticing; Kristen ended up being the sneaky sleuth to acquire the goods! Looking back, this was perhaps the most interactive theatre show we’ve had the pleasure of participating in. Dinner was absolutely divine, having been curated to perfection by 2017 MasterChef ‘The Professionals’ finalist, Louisa Ellis. Our amuse-bouche was rich and creamy, coming in the form of a sweet yet savoury Butternut Squash Volute spiked with toasted pumpkin seeds and chive oil. Continuing to the starter, the Black Garlic Gnocchi was probably our favourite of the night, complete with wild mushrooms, truffle and nasturtium. The main was a strong contender for best plate, combining Pan Seared Guinea Fowl Breast with celeriac textures, anne potato, braised leek and arran mustard sauce. And finally, we finished the feast with a Chocolate Ganache dessert, accompanied by honey ice cream, bee pollen, tuile and honey crisp. Awkward third wheel life… all too familiar. There were so many great, well thought-out aspects to our evening at Journey to the Underworld. We particularly loved the way the production had set up moving screens to mimic train windows on each side; we actually felt as though we were in motion on a real train at points in the performance! The set up was cosy and intimate, serving as a super fun first date experience, or even a just a different kind of night out with friends. 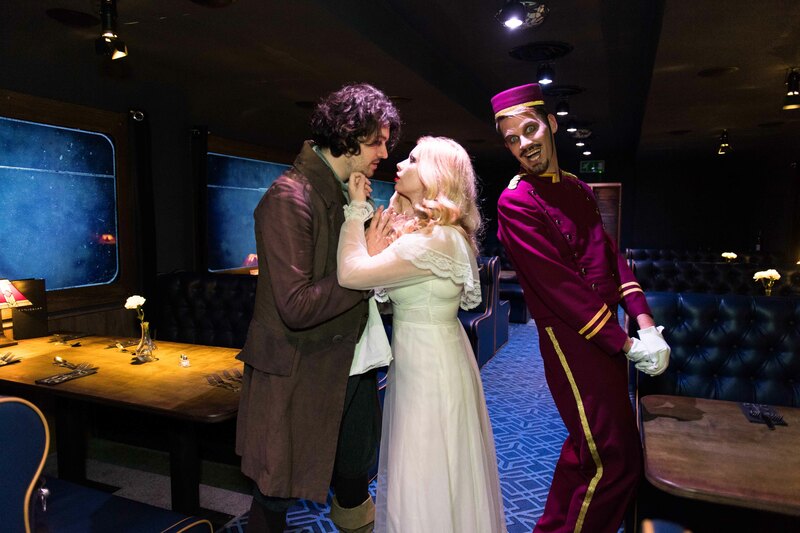 To embark on your very own ‘journey to the underworld’, you can book tickets here. Come prepared for spooks, sparks and spectacular acts put on by the talented team at Furnicular Productions!